Try Continuous Ink System with your Brother MFC-495CW and make 30 times more quality prints for the same money! Pay only 0.04 USD for A-4 full color print! The printer Brother of All-in-One class offers its users significant operational performance and speed, which is enough for any small business or home office. This printer is equipped with a convenient automatic document feeder for 15 sheets, which allows comfortable operation of fax, allows to copy, scan, or just print documents. Internal memory of the device may store up to 80 numbers of speed dial and up to 480 pages of scanned documents. Faxes are sent quickly enough, the device consumes approximately 3 seconds per page. 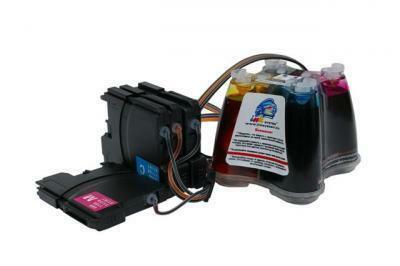 The unique four-color cartridge, of course, can significantly save your money by providing the ability to replace not the entire cartridge, but only an empty ink tank. The design of the ink unit consists of four containers, each having a different ink color. With the emptying of one of the containers it is not necessary to replace the entire unit, you can replace only the container that is already empty. An inkjet printer of this type is a perfect companion in any house, small or medium office and even at school or other educational institution. What is the use of CISS for brother mfc-495cw? ciss ink system brother mfc-495cw вЂ“ it is a special device, made for large amounts of printing, such as color copying, immediate printing from digital media, photo printing, posters and other advertising materials. ciss mfc-495cw, as well as next models ciss for brother dcp-6690cw and ciss for brother mfc-685cw, is a device, which consist of ink containers, connected with the help of multichannel silicon loop with the cartridges, identical to original ones. Allows to decrease the printing cost in 40-50 times (according to the model of the printer or MFD) in comparison to original cartridges application. It excludes the necessity of regular buying of cartridges and wasting time (for instance when you need to print something in the evening, but the printer informs you about the "replacement of ink cartridges"). For imitation of cartridge replacement, when the printer requires to "replace ink cartridges" it is necessary to push down the "nulling" button, placed on the cartridge block of Ink supply system. Using bulk ink system for brother mfc-495cw you constantly visually control the ink level in the donor reservoirs, and in its significant reduction you simply add the proper ink when necessary. The capacity of each ink color in CISS for mfc-495cw makes about 80 grams, what is much more, than the capacity of ink in an original cartridge (7-15 grams).